Maintaining form. Anastasia Chitty and OUWBC President Maxie Scheske, Stroke and 7 of Boudicca. A small piece of history was made on Thursday, 19 December, when the Oxford and Cambridge Women’s Trial Eights were held over the full Tideway course for the first time. I was lucky enough to get a place in the press launch on a windless, mild and bright winter’s day with beguine river conditions. My only concern was that I would get bored after the first few minutes of each trial, fearing a five-minute race and a fifteen-minute procession. Be assured that this apprehension was not a result of any archaic ideas about women’s rowing, rather it was based on the fact that long running injustices can take a long time to put right. The men in (Chris’s) view, ‘struggled for 180 years to make a really good, nail biting contest of it for 4 miles and 374 yards’. He says that, until they received proper funding and professional coaching in the 1980s, the men were not fit enough to race the full distance. The result was a mad scramble to reach Hammersmith Bridge, by which point the winner usually emerged and the loser followed in their puddles in the long row to the finish. Chris says that this has now changed and that the Boat Race ‘has come of age as a superb event’. Key question over Women’s Boat Race answered decisively. Can WBR be a contest over the full course? 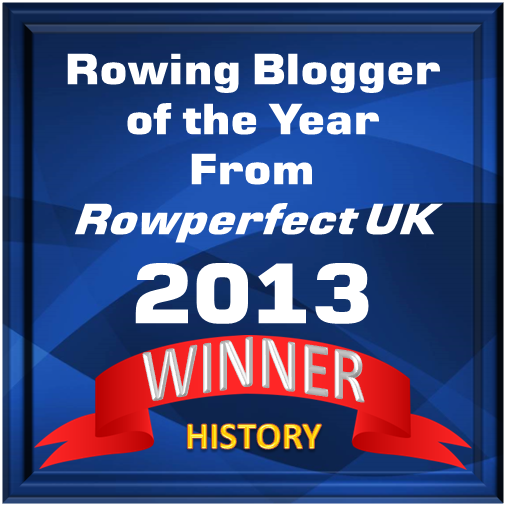 Both Trials lasted past Chiswick Steps – more than most men’s races until 15 or so years ago. None of the four coxes who raced today, or the two who raced with the CUBC men the day before, were faultless. 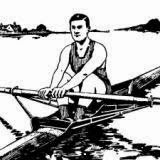 The Boat Race, more than any other, is a coxswain’s race and perfection is what is really required. As I cannot better the excellent race reports published on the official Boat Race website, I am reproducing them verbatim below, interspersed with my photographs. Cleopatra, with the experienced Harriet Keane rowing at 5, won the toss and chose the Surrey station, leaving Middlesex to Boudicca, with Oxford president Maxie Scheske in the 7 seat. With three-times Boat Race winner Sarah Winckless taking charge in the umpire’s launch, the crews set off in perfect racing conditions, with Cleopatra rating 39 strokes a minute and Boudicca at 38. Oxford off the start at Putney Pier. Cleopatra left and Boudicca right. Past the boathouses Boudicca was already looking the more together crew, settling at 36 strokes a minute and leading Cleopatra by half a length. The women in Boudicca used the inside of the Middlesex bend to good advantage, increasing their lead to ¾ length before cox Erin Wysocki-Jones cut off the corner at Craven Cottage, and Cleopatra were able to get back in to the race. Cleopatra, on Surrey, began to claw back the deficit, despite underrating the leaders, until they reached Hammersmith Bridge where the crews were level. Despite steering wide, Boudicca held their ground, and the crews were still level as the race entered the rougher water off the top of Chiswick Eyot. With the race still level at Chiswick Steps, Cleopatra pushed on hard approaching the Crossing where they led by half a length, but Boudicca found a new rhythm and lengthened out their stroke, still at 30, to regain the lead approaching the bandstand. There was a full boat length in Boudicca’s favour at Barnes Bridge where the leaders were able to sit up confidently and increase their lead, eventually crossing the line 3 lengths clear, to win a well-fought race. The first Cambridge women’s crews to trial over the full Boat Race course were Nudge Nudge, coxed by their president, Esther Momcilovic, and Wink Wink, with double Blue Caroline Reid in the 5 seat. Cambridge off the start. Wink Wink on the left, Nudge Nudge on the right. Nudge Nudge won the toss and chose the Middlesex station, setting off at 40 strokes a minute against Wink Wink at 41, but it was the Surrey crew who drew ahead past the boathouses, maintaining a high rate at 37 while Nudge Nudge had already settled at 35. Rowing in a solid style, Wink Wink increased their lead to 2/3 length at Barn Elms, rating 34 to Nudge Nudge at 32 but the Cambridge President steered a better line than the Oxford crew on Middlesex had done an hour earlier. Now it was Nudge Nudge who looked the more rhythmic crew, and past Harrods the crews were level once again. With both crews rating 33 beneath Hammersmith Bridge Nudge Nudge now pushed on hard and gained half a length around the outside of the bend. They maintained the same margin to the top of Chiswick Eyot and then made the move that would determine the outcome of the race. Upping the rate a couple of pips they took a further half a length off the opposition in about ten strokes and past the Crossing they led by a full length. With both crews at 31 strokes a minute Nudge Nudge gradually extended their lead, but a spirited finish by Wink Wink closed the gap a little as the finish line approached. Nudge Nudge were declared the eventual winners by three lengths, rounding off a day of excellent racing which bodes well for The Newton Women’s Boat Race itself in just over three months’ time. On returning to Putney we found one of the things that they don’t teach you at Cambridge – tides go out and tides come in.